Mens Womens Water Shoes Quick Dry Barefoot for Swim Diving Surf Aqua Sports Pool Beach Walking Yoga | What Should I Say? Putu is constantly creating new series of women's and men's water shoes to meet our customers' expectation. In Putu, we believe the idea of "Customer First and Products First".We want more people to enjoy their vacation more easily. 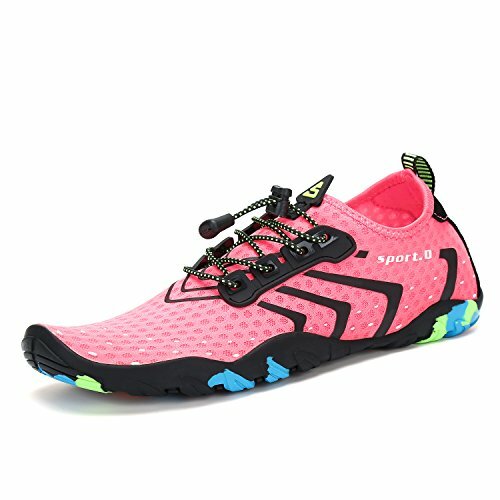 In the summer of 2018 years, our company focused on creating the Pirate series of water shoes. They are: The Black Pearl, Flying Dutchman, Queen Anne's Revenge, Empress, Endeavour and The Dauntless. Our design and R&D team has developed 6 styles and 49 colors in order to satisfy customers with greater demands, allowing you to have more choices according to your preferences. Its upper is made of breathable and elastic Lycra material, which allows you to have a stronger sense of experience when participating in various water activities. The shoe sole is the result of our R&D team using a year's time based on various experiments. It has a powerful drainage hole after the upgrade, allowing water to leave your feet faster, while it has sole patterns and high-grade rubber. The composition is designed to be more non-slip and has achieved better protection of your feet. When you go to vacation, aqua sports,diving, waterpark, water aerobic classes, rafting, through the waterfall, driving, car-washing, etc.You can easy put putu water shoes in your bag and take it to everywhere. Thank you for your trust in Putu water shoes. At the same time hope that you can give us valuable advice and let us make better water shoes. If you have any questions about this product by Putu, contact us by completing and submitting the form below. If you are looking for a specif part number, please include it with your message.